For decades, Karl and Tina Weber have treated guests to a celebrated horseback riding program, world-class fly fishing waters, fine dining and relaxation at its best. Appreciative guests who return to this authentic Jackson Hole dude ranch year after year prove that the Gros Ventre River Ranch experience is truly something special. Since horse riding is this guest ranch's main attraction, the riding program is designed to be flexible for riders of various skill levels. 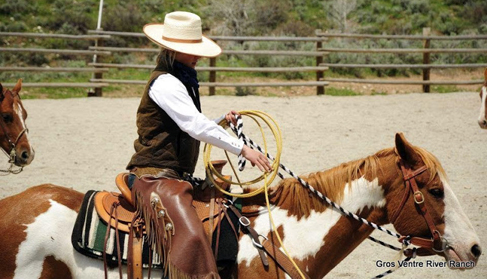 Gros Ventre River Ranch offers wrangler guided rides twice daily (except Sunday) at walk, intermediate (jog) or advanced (lope) with no more than seven riders to a group. The specialty trail offerings throughout the week vary from half day rides, all day rides, picnic rides and early morning site-seeing rides. Guests also enjoy team sorting and team penning the steers and watching ranch roping demonstrations in the arena. 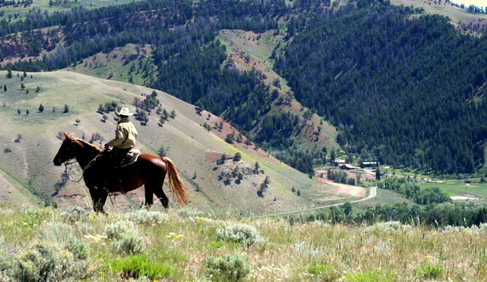 The ranch is nestled in a valley in the Gros Ventre Wilderness and mountains. The numerous trails enter into the Teton National Forest and Bridger Teton Park, with varied mountain terrain. Gros Ventre River Ranch sits at just under 7000 ft. with trails crossing altitudes up to our highest all day ride to Sleeping Indian, which is around 11,000 ft. If you would like a break from riding one day during your stay, try fly fishing on the stocked ponds or in the Gros Ventre River that runs through the ranch, a nature hike on an unlimited number of wilderness trails, singing around the campfire roasting marshmallows, or enjoy a glass of complimentary wine while sitting on our deck overlooking the Gros Ventre River and Grand Teton Mountain Range. There are also plenty of hammocks around the ranch or choose a sitting rock next to the river to view the busy beavers in their den. Again, all of this is included in the rates. Bringing the kids? 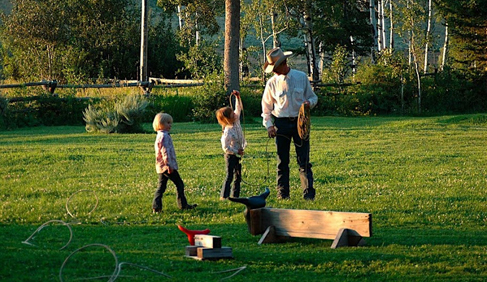 Gros Ventre River Ranch has a variety of kid-friendly dude ranch activities including horseback riding, fishing at the pond, mountain biking, a rec room in the downstairs of the main lodge with foosball, ping pong, pool, puzzles, games, movies and more. During the early season, Gros Ventre River Ranch requires a three night minimum and we discount your stay from Peak Season rates. The Peak Season offers guests added amenities and activities and require a week minimum stay (Sunday to Sunday). In September, Gros Ventre River Ranch again offers a three night minimum, discounts and reserves the ranch for adults only. A guest ranch vacation is very unique and in order to really get the feel and settle in, Gros Ventre River Ranch always recommends a week stay, even during the early season. However, Gros Ventre River Ranch realizes that is not always possible and therefore, if you choose to visit during the early season and would like to stay less than a week, Gros Ventre River Ranch recommends that you make your plans to arrive or depart on a Sunday. 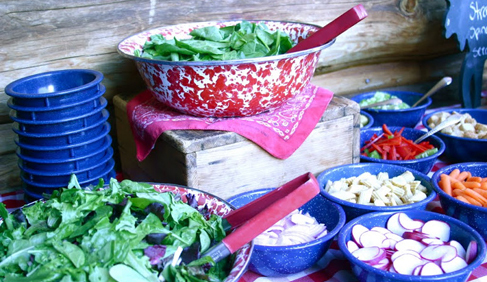 For example, if you would like to stay only three nights, Gros Ventre River Ranch suggests that you make your stay from Sunday to Wednesday or Thursday to Sunday. 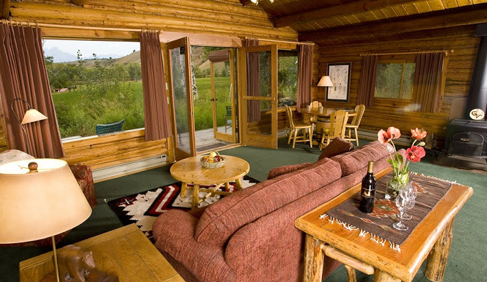 Gros Ventre River Ranch is an all-inclusive ranch that provides horseback riding, hiking, fly fishing, and wildlife viewing to families, couples, and singles. Join Gros Ventre River Ranch for early season specials! 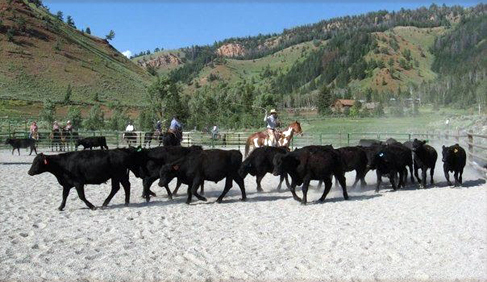 Until mid-June each year, this Jackson Hole Ranch offers discounted pricing and daily rates. During this time, beginner, intermediate and advanced horseback rides go out twice a day, and fly fishing guides offer group clinics and private lessons on our stocked fishing ponds. In addition, the ranch offers a guided hike for guests looking to discover wildflower filled meadows, ranch lookouts and more! Flexible stays during the Early Season 3 night minimum from June 11-25, 2017. Stays begin on Sunday or Wednesday. 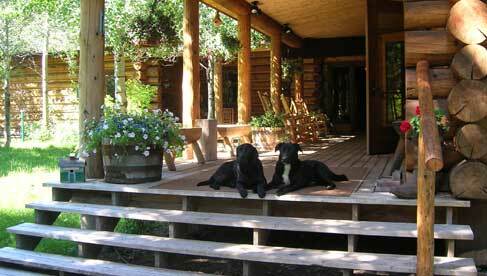 Gros Ventre River Ranch rates are 12% less from peak season rates during the early season. Please see the rates page for more details on this Jackson Hole lodging deal. Learn more! Call 307-733-4138. Email the ranch. 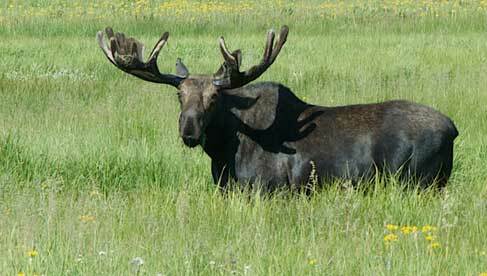 Visit Gros Ventre River Ranch's website. 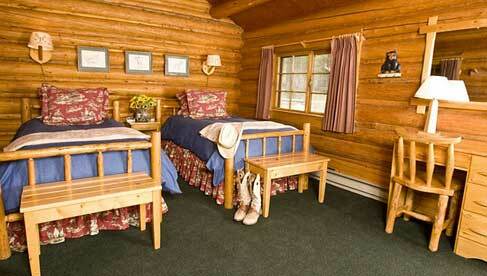 The ranch offers four log cabins and four log lodges. 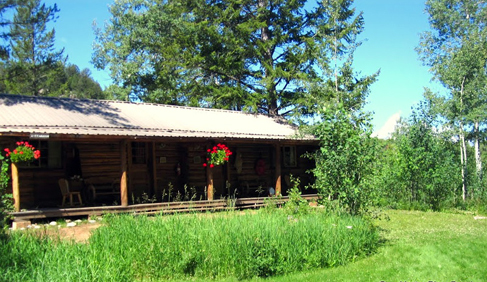 Each of the four quaint log cabins is a two bedroom two bath accommodation with a common front porch situated amidst Aspen trees and large Pine trees and can be rented separately by room. 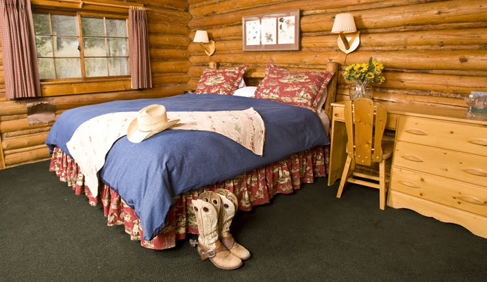 These 1950's style cabins are decorated in a wonderful western taste, with handmade log furniture, feather comforters on the beds, clean and crisp linens, ceiling fans and baseboard heating. 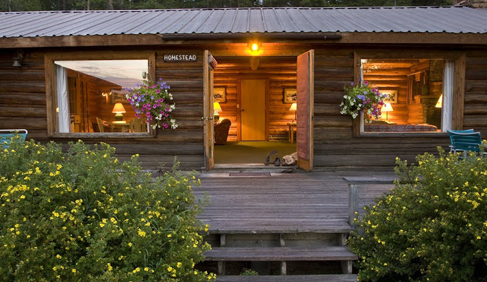 The spacious log lodges are two bedroom two bath accommodations with private decks, a living room and views of the Teton Mountain range. The living room is equipped with sliding glass doors, a kitchenette and a wood burning stove. 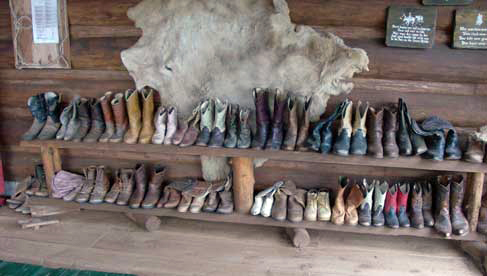 This Wyoming dude ranch also offers one three bedroom three bath historic lodge called the Homestead House. The master bedroom has a large living area with a kitchenette and a fireplace. The second bedroom has two twin beds, a private bath and a wood burning stove. The third bedroom also has two twin beds, a private bath and a private deck. Regardless of accommodation, the ranch provides amenities such as a hairdryers, coffee makers, cd/alarm clocks and daily housekeeping service, including a turndown service each evening. 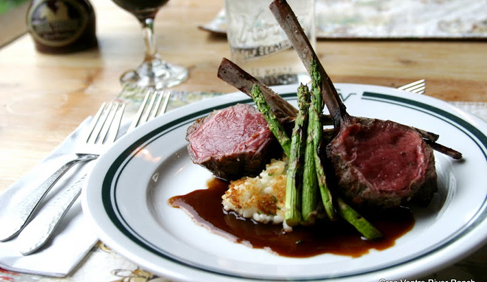 Excellent cuisine with fresh fruits, homemade breads, grilled game meat and vegetables; cookouts; wine included each evening. Gros Ventre River Ranch is located 50 miles from Yellowstone, 12 miles from Grand Teton National Park and 18 miles from the town of Jackson. For those that would like to get off the ranch for a day, Jackson offers eloquent Galleries, museums, western shops, world class golf courses and local theater. Enjoy the Jackson rodeo and the local nightlife, if you wish. 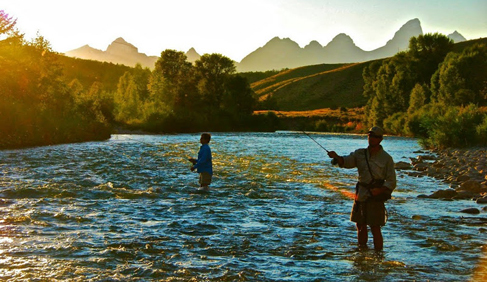 Guided fishing trips or float trips with a local outfitter on the Snake river can be arranged for you, as well as rock climbing the Tetons. There is also the endless opportunity for wildlife spotting and birding. 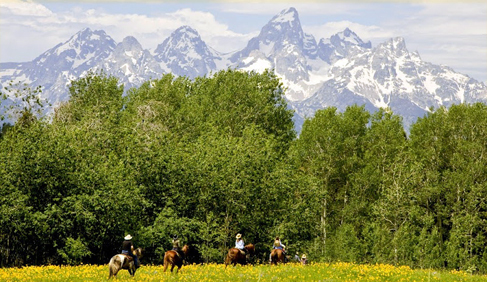 Authentic Jackson Hole dude ranch with horseback riding in the Gros Ventre Wilderness, Teton National Forest and Bridger Teton Park, private fly fishing, hiking and more! 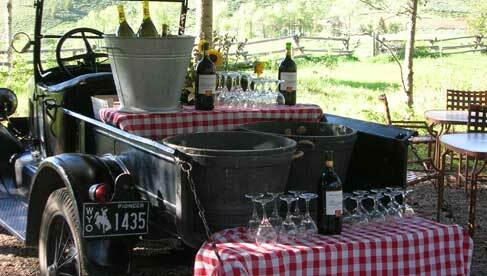 This ranch can accommodation small corporate groups for retreats and meetings. Cash, check, travelers checks and money orders. Check out dates and rates!